Scientists think that this may be the oldest star in the known universe. It is located about 6,000 light-years away from Earth. Astronomers have found what appears to be one of the oldest known stars in the universe. The ancient star formed not long after the Big Bang 13.8 billion years ago, according to Australian National University scientists. The star (called SMSS J031300.362670839.3) is located 6,000 light-years from Earth and formed from the remains of a primordial star that was 60 times more massive than the sun. Keller and his team found that the star actually has an unexpected composition. Astronomers thought that primordial stars — like the one that SMSS J031300.362670839.3 formed from — died in huge supernova explosions that spread large amounts of iron throughout space. However, the new observations have shown that SMSS J031300.362670839.3's composition harbors no iron pollution. Instead, the star is mostly polluted by lighter elements like carbon, ANU officials said. "This indicates the primordial star's supernova explosion was of surprisingly low energy," Keller said. "Although sufficient to disintegrate the primordial star, almost all of the heavy elements such as iron, were consumed by a black hole that formed at the heart of the explosion." The scientists also found that the early star's composition is very different from the sun. "To make a star like our sun, you take the basic ingredients of hydrogen and helium from the Big Bang and add an enormous amount of iron — the equivalent of about 1,000 times the Earth's mass," Keller said. "To make this ancient star, you need no more than an Australia-sized asteroid of iron and lots of carbon. It's a very different recipe that tells us a lot about the nature of the first stars and how they died." Because of its low mass, the star, located in the Milky Way, has a long lifetime, Anna Frebel, an MIT astronomer associated with the research, told Space.com via email. 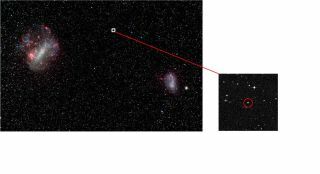 Keller and his team found SMSS J031300.362670839.3 by using the ANU SkyMapper telescope. SkyMapper is surveying the sky at the Siding Spring Observatory in Australia to produce the first-ever digital map of the sky in the Southern Hemisphere. They confirmed their observations using the Magellan telescope in Chile. The new results are detailed in the journal Nature.